The gaps in your smile left by missing teeth should be filled as soon as possible, because leaving them there can result in serious dental problems. The surrounding teeth will eventually shift out of position, causing discomfort, TMJ symptoms, difficulty chewing or speaking, or possibly tooth decay and gum disease. The supporting bone around your missing teeth will also begin to deteriorate over time, resulting in facial collapse. Dental bridges are appliances that “bridge” the gaps left by missing teeth. They are attached to the teeth on either side of the gap, or to a dental implant placed for that purpose. Dental implants are artificial tooth roots made of titanium that are actually implanted into your jaw bone. To crate a new tooth, they are capped with a dental crown. 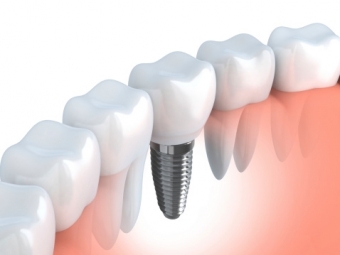 The benefits of a dental implant is that it looks, acts and feels just like a natural tooth. Of the two, it is the more secure and permanent option. A dental bridge may be a better tooth replacement option for you, however, if the neighbouring teeth have large fillings in them, and may need crowns or caps down the road. If the tooth or teeth have been missing for a longer period of time, the gum and bone around the gap will have deteriorated to some extent. This will mean that additional, more invasive procedures, life bone or gum grafts, may be required in preparation for a implant. In these cases, some people feel that getting an implant is not worth the extra time, discomfort and expense, and so opt for a bridge instead.